A beautiful summers day, so we decided to visit a garden we had not seen before. Hinton Ampner is a National Trust property near Winchester. The house is nothing special but the garden is divine. It was put together by the last Earl of Sherborne from 1936 until he died in the mid 1980s. 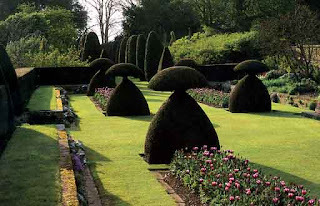 The topiary that you can see in the picture is very pleasing, but what is remarkable are the scents. The old English roses are strong smelling varieties and at the moment the Philadelphus or 'mock orange' is florid.